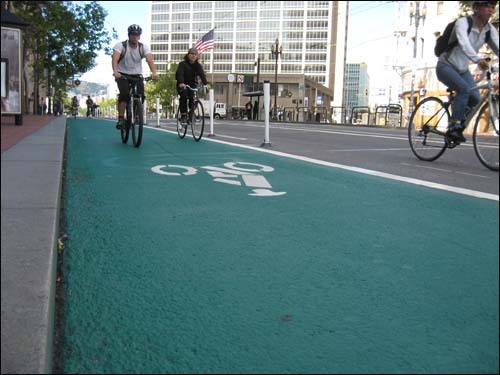 San Francisco’s first colored bicycle lane on Market Street. 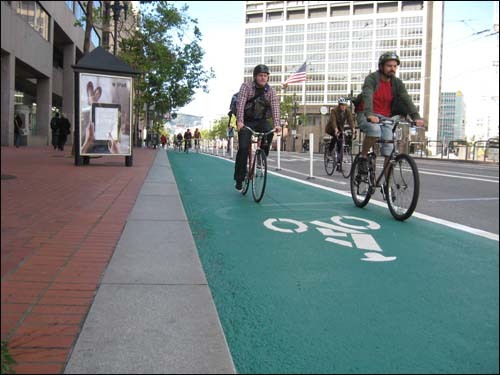 In the last few months riding a bicycle in San Francisco has gotten a little bit easier, thanks to a number of bike infrastructure improvement projects that have been recently completed. Sustainable transportation activists and the SF Bicycle Coalition are continuing their work to make biking safer and more enjoyable for everyone. During Bike to Work Day last week, bicyclists accounted for a record-breaking 75% of all morning traffic downtown. In addition to now having fewer private vehicles on Market Street, the main thoroughfare has just gotten its own partially separated bike lane with colored green pavement. And when you are ready to lock up your bike, there is also now more secure bicycle parking in the city. 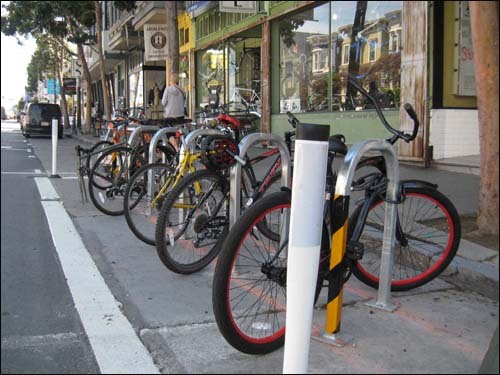 Additional on-street bicycle parking has been added at several locations on Valencia Street and in other neighborhoods. Some of the newly installed on-street bike parking on Valencia Street. The number of new biking improvements seems to have really had an impact upon bike commuting. The amount of people bicycling has increased over 53% in San Francisco since 2006; something that is readily apparent as I see more and more happy bicyclists riding everywhere throughout the city.